The first book-length study in English on Volodymyr Vynnychenko (1880–1951), this book explores how emigration transformed the creative palette of this important Ukrainian historical figure and a gifted author of international stature, and offers a unique examination of creativity and the challenges faced by writers in geographical displacement. “Whom do our people read? Vynnychenko. Whom do people talk about if it concerns literature? Vynnychenko. Whom do they buy? Again, Vynnychenko.”—wrote the writer Mykhailo Kotsiubynsky about the young Volodymyr Vynnychenko in 1909. These words aptly convey the enormous popularity of the innovative and provocative author and charismatic politician who not only witnessed the dramatic upheavals of the first half of the twentieth century, but was consistently involved in portraying that reality, undermining old values and bringing forward new ideas about human relationships. Usually overlooked is the fact that Vynnychenko, as a political émigré fleeing Soviet tyranny, lived most of his life and wrote the majority of his works outside his native land, in Western Europe. In this ground-breaking study Mykola Iv. 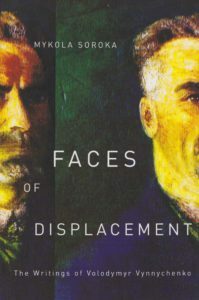 Soroka draws on contemporary theories of displacement to show how Vynnychenko’s constant state of being in-between determined his worldview, choice of literary devices, and his attitude toward both his homeland and hostland. Employing postmodern concepts of identity, this study describes the various intertwined experiences of the writer—as an exile, émigré, expatriate, traveler, and nomad—and demonstrates how they interacted in invigorating his creativity, influencing his ways of socializing and enjoying personal freedom, while directing his existential anxieties into implicit nostalgia, utopian constructions, and universalist predispositions. This book starts with an introduction, which addresses the contemporary discussion on literature and geographical displacement, its historical forms and comparative aspects and employs postmodern concepts of identity to establish the theoretical framework for this study. The main part of the book is divided into two parts, chronologically and thematically structured, with biographical notes included throughout that demonstrate how certain conditions motivated and were reflected in particular works. Part One covers the period of Vynnychenko’s displacement from 1907 to 1914, which marks the beginning of the Great War, followed by revolutionary upheavals. It deals with Vynnychenko the émigré, expatriate/traveler, and exile. The writer’s works are still actively present in the homeland literary discourse, and he is preoccupied with social, cultural, moral, and ideological issues significant for his country, such as revolution, morality, love, family, prostitution, and human instincts. In this period, as an expatriate he also enjoys his sojourn in Europe, which significantly reinforces his modernist views and provides him with opportunities for new contacts, education, art appreciation, and the benefits of personal freedom. At the same time, as an exile the writer is reluctant to assimilate to the hostland. This engenders some anxiety and escapism, which is counterposed by nostalgia as a means to sustain his identity. Part Two is dedicated to Vynnychenko’s second displacement in 1920–51, which is analyzed as a cardinally different period, with an emphasis on his utopianism, universalism and late homecoming. Vynnychenko channels his existential uncertainty about the present by projecting a utopian future in his novel The Solar Machine. His universalism at this stage is a reflection of the writer’s nomadic uprootedness, which resulted in his reorientation to a broader international audience and to issues of international significance (peace, war, co-existence), and in attempts to initiate the reformation of society and human morality (philosophy of concordism). The study ends with an examination of Vynnychenko’s late homecoming in Take the Floor, Stalin!—a swan song, that despite its general universalist framework, is also imbued with exilic feeling and autobiographical memories in his final years. Mykola Iv. Soroka received his Candidate of Philological Sciences at the Taras Shevchenko National University of Kyiv (1995) and Ph.D. in Modern Languages and Cultural Studies at the University of Alberta (2005). He is the author of the monograph Visual Poetry in Ukrainian Literature in the End of the 16–18 Centuries (Kyiv, 1997). His recent publications explore Ukrainian-Russian relationship of the interwar period in emigration, and issues of modernity, displacement, and travel in Ukrainian literature. He is currently the development coordinator for the Canadian Institute of Ukrainian Studies at the University of Alberta.